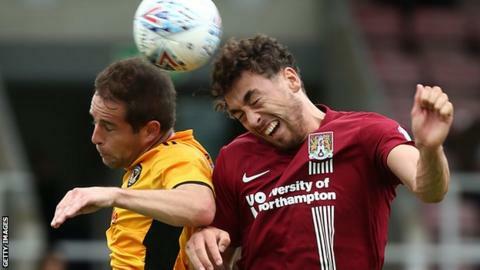 Northampton Town midfielder Matt Crooks says the players must take individual responsibility for finding a way to kick-start the club's season. The Cobblers have lost all four games so far, scoring just once. Crooks, who arrived from Rangers last month for an undisclosed fee, said he had been "too sloppy" in possession. "I look at (video) clips to see what I could have done better and I think as a team we've got to do that," the 23-year-old told BBC Radio Northampton. "Obviously the mood isn't 100% but you've got to remain positive. "It's early in the season and we're still gelling as a team so you can't dwell on things for too long." Northampton are at home to Peterborough United on Saturday in what the two clubs - who are 44 miles apart - regard as a local derby. "We've just got to try and get three points from somewhere. It doesn't have to be playing like Barca as long as we get three points, that's the key thing now," added Crooks. "Derbies are big for the fans and the players, you can feel the atmosphere in the ground and it's a perfect opportunity to get three points at home. "We all want to win games. We've just got to keep progressing as a team and as individuals and try and get that win. "Sometimes it doesn't happen straight away, and it hasn't for us, but there's plenty of time, still a lot of games left."